While all the world (or so it seems) has been fixated on the Pope's catechesis on condoms these last 30-odd hours, what for ad intra purposes could be seen as an even more significant set of comments seems largely to have slipped under the radar... even if they merely came from the church's freshly-Porporato "chief justice." 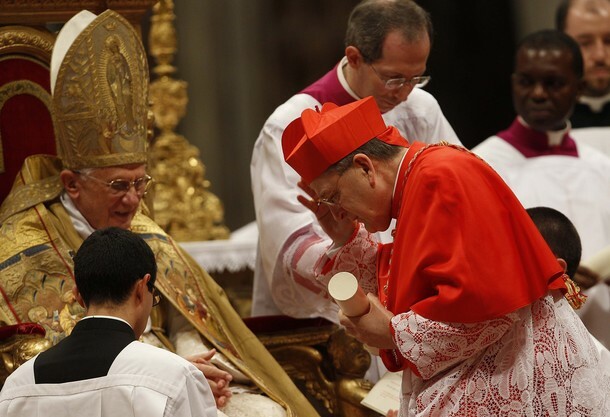 In a nutshell, anyone who thought the red hat would see Raymond Cardinal Burke take an eased stance toward what's become his signature concern -- the public square in general... and above all within it, the admission to the Eucharist (or lack thereof) of Catholic politicians who defy church teaching on the legalization of abortion -- might want to think again. Sure, there's already been evidence of the cardinalate's effecting an enhanced Burkean boldness: the very day the former St Louis' archbishop's name was announced by B16 as a member of this Consistory class, the prefect of the Apostolic Signatura recorded a half-hour video interview to help Catholic voters on these shores form their consciences in the run-up to the Midterm Elections. 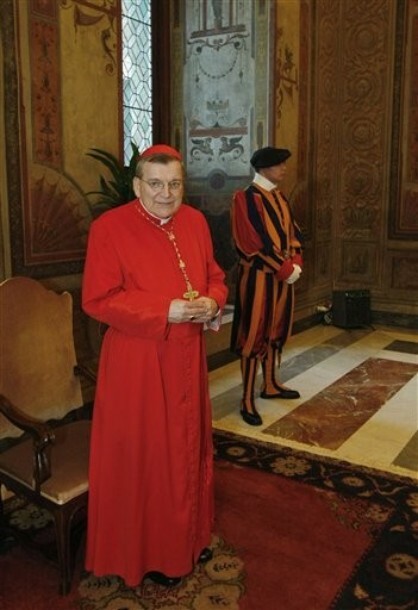 Now, however, in a sit-down with Vatican Radio that aired as Elevation Day dawned, the Wisconsin-born master canonist upped the ante, taking his interpretation of Canon 915 to a previously unseen level... even if the printed summary of the encounter failed to convey the full thrust of the thought. Q. You’re known as a man with very firm ideas about the moral rectitude of those who profess Catholicism -- ideas that don’t always sit comfortably with everyone -- and I’m thinking of some of the remarks you’ve made about pro-abortion politicians, for example, receiving Communion -- the Holy Eucharist -- in the United States. Have you ever felt discouraged that people aren’t just getting the message? Burke: I think it’s only natural to be tempted to discouragement, and I’ve had those temptations -- for instance, on the question of a person who publicly and obstinately espouses the right of a woman to choose to abort the infant in her womb receiving Holy Communion, strikes me as something very clear in the 2,000 years of the church’s tradition -- she’s always firmly held that a person who is publicly and obstinately in grave sin should not approach to receive Holy Communion and, if he or she does, should be denied Holy Communion. Why? First of all, to avoid for the person -- himself or herself -- committing a sacrilege: in other words, receiving the Sacrament unworthily, and also because the holiness of the Sacrament itself demands that one be in a state of grace to receive the Body and Blood of Christ. Therefore, when I set this forth, really -- and it’s not a new idea on my part -- and if I’m firm about it I have to say that that is in line with the constant tradition of the church. [Emphasis added] It is discouraging that either members of the church claim not to understand this, or they claim that in some way there is an excuse for someone who is publicly and obstinately in grave sin to receive Holy Communion. I look at it this way: this response on the part of many in the church comes from living in a society that’s completely secularized, and the thinking that is marked -- the God-centered thinking which has marked the discipline of the church -- is not easily understood by those who are bombarded day in and day out with a kind of God-less approach to the world and to many questions. And so I try not to get discouraged but to try to continue to speak the message in a way that people can understand. I try not to be -- and I don’t believe that I have been -- harsh or angry in my teaching. Certainly, I always could’ve been more effective in it, but try to speak the truth with love as the Holy Scriptures say, but also to realize that one has to continue to proclaim the message in season and out of season, and whether it’s being warmly received or not being received or being resisted or criticized doesn’t excuse the bishop or the priest from teaching clearly or steadfastly. 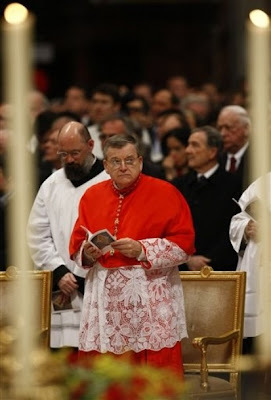 Answering a follow-up question, Burke admitted that the matter proved a "difficult" one, but stood his ground, saying that "when a bishop takes appropriate pastoral measures in this regard, he's also helping very much brother bishops, and also the priests." Needless to say, the new red-hat's convinced-and-convicted stand has long had him on a collision course with no shortage of other top hierarchs at home -- his fellow cardinal of this intake from the States long prominently among them. Now, though, thanks to another of this eventful week's major movements in Churchworld, the lead domestic player who views things differently is an equally-outspoken president of the US bishops. And, well, just further proof that we're in for quite the ride these next three years.